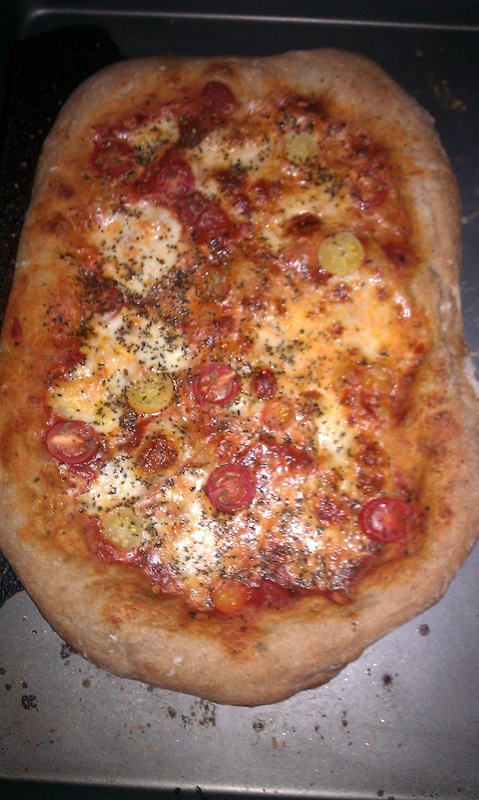 I love making pizza. There's just something really fun about making pizza with family. There's flour all over the kitchen and most of the time all over me, and there's always lots of laughter when trying to throw and roll out the pizza dough. It's the type of meal that creates a fun mess, and the final product doesn't have to look perfect. This is a super easy and yummy recipe for the whole family! Sprinkle flour right onto your counter, and let dough sit out for 20 minutes. Preheat oven to 450F. Roll out dough on a floured surface with your hands or a floured rolling pin. Ladle 1 cup marinara onto the dough and spread evenly. Slice fresh mozzarella and place around the pizza. 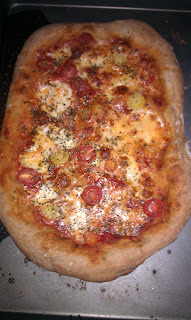 Halve the cherry tomatoes and place them around the pizza. Sprinkle handful of chopped basil leaves all over the pizza. Brush the crust with olive oil and cook for 15-18 minutes. Cut into slices, serve and enjoy!